. يقدم Julians Apartments خدمات لا غبار عليها وكل أشكال اللياقة وحسن الضيافة اللازمة لإسعاد ضيوفه. إن واي فاي مجاني في جميع الغرف, تخزين الأمتعة, واي فاي في المناطق العامة, صف السيارات, جولات هي جزء فقط من الخدمات التي تميز Julians Apartments عن باقي الفنادق في المدينة. تنعكس أجواء Julians Apartments في غرف الضيوف.تلفزيون بشاشة مسطحة, اتصال لاسلكي بشبكة الإنترنت (مجاني), مكيف هواء, تدفئة, شرفة/ تراس هي بعض الميزات الموجود في العديد من الغرف. يقدم الفندق العديد من الفرص للاستجمام كمثل مسار جولف - ضمن 3 كم. مهما كانت دواعي سفرك فإن Julians Apartments هو خيار ممتاز لإقامتك في خليج بريون. يُرجى ملاحظة أنه يتعين على النزلاء إبلاغ الفندق مسبقًا إذا كان من المتوقع أن يصلوا إلى الفندق بعد الساعة 5:30 مساءً في أيام الإثنين إلى السبت أو بعد الساعة 2:30 ظهرًا في أيام الأحد، وذلك حتى يتسنى إجراء ترتيبات تسجيل الوصول بعد ساعات العمل. يمكنك الحصول على بيانات الاتصال من رسالة تأكيد الحجز الخاص بك. It had everything we needed and more. We loved being able to cross the road and be at the beach. Bumped into the owners and they were super lovely! Got to meet their beautiful dog which I got the best cuddles from. A great spot to base yourself in town, if visiting Byron Bay. The apartments have everything you need and the staff were very friendly and accommodating. 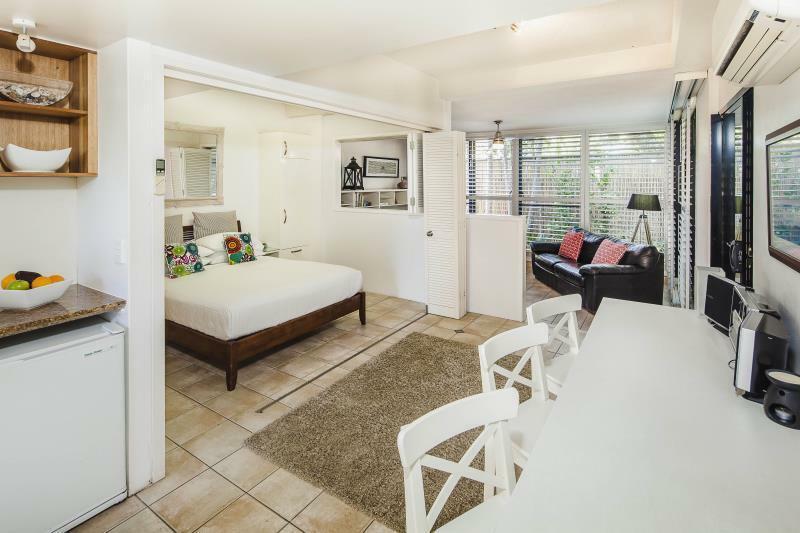 It's walking distance to Cape Byron too! The only negative for me was the lack of insulation between apartments - I could hear a lot of noise from upstairs and people walking past our bathroom (from the outside). Nonetheless I would recommend to others. Fantastic location for us to walk to the lighthouse each morning and a nice 15 minute walk home from dinner in the main streets at night. 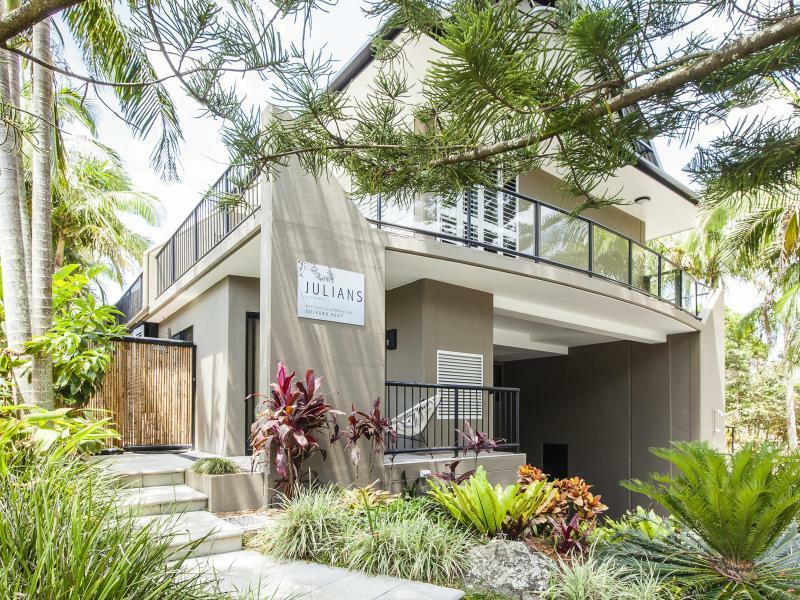 Julians is close to the beach and walking tracks. It was clean, comfortable and perfect for our short getaway. The undercover parking was a huge bonus. Lovely clean studio apartment, close to beach. Perfect location a 10-15 min walk away from the hustle and bustle, so relatively quiet. Underground, shaded secure parking. Well equipped kitchen and generous balcony area-ideal for alfresco dining. Bed very comfy. We would stay again and recommend to friends. We found this apartment great value for money and in a location - the beach is across the road. It took 10 minutes to walk into and less than 2 to get to the beach. We would definitely stay here again! We have stayed at Julians multiple times. Each apartment is slightly different but each one we have stayed in has been clean and comfortable. comfortable and tidy room, helpful and friendly staff ! Our Apartment was very comfortable & clean.Bathroom toiletries good quality . Especially liked the outdoor garden area for relaxing with comfy day bed & good seating for dining. Weber BBQ supplied.Would have been great if weather warmer & summer outdoor dining. Also coffee machine with 6 pods ( you can buy more reception ) small fresh milk in fridge on arrival. Recommend you do sunrise lighthouse walk.Julian's is great location midway between lighthouse & township. We just walked to dinner every night & left car parked garage entire stay. Byron Bay traffic is busier every year so good option. Council have also put parking meters all around town. Also close to a couple nice beach side cafes for breakfast. Recommend Beach restaurant & Pass cafe close by. Our stay at the Julians Apartments was perfect. The room was clean, comfortable and well stocked. They even had milk in the fridge for our coffee/tea. Kristy and Paul were helpful in every way. I hope we can come back for a longer visit. We were received earlier than check in time and the room was fabulous, with a kitchenette, huge comfy bed and appropriate modern bathroom. 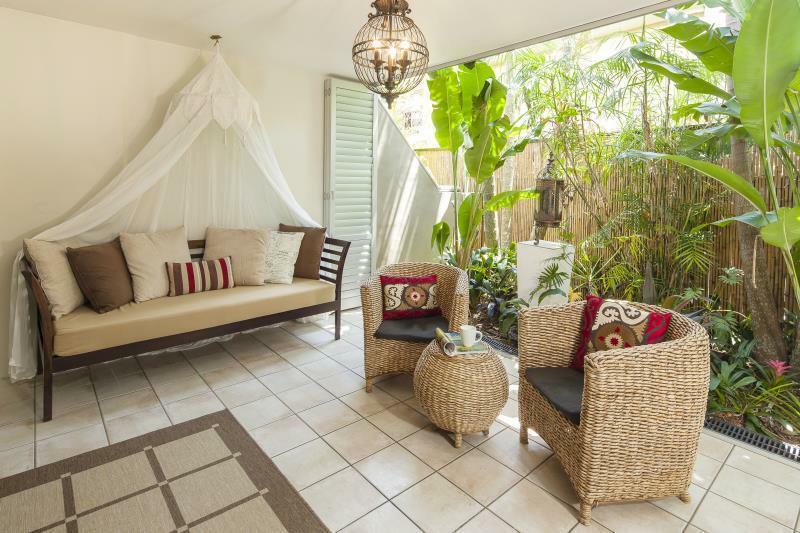 The balcony is spacious with a nice garden and a sofa bed perfect for reading. Best part is the location near the beach probably 5 minutes walk and a great outdoor fresh shower. ON the other side you can walk 10 minutes to the Byron beach café for breakfast and another beach access. Loved the place and made us feel at home. Mostly enjoyed the stay. Yes, the balconies overlook the next house, the room was a little more full of things than needed, but a good choice for BB. The room has all you need, is in a good and quiet area, just 10-15 minutes walk to town. It was great. Nice staff. Very close to the beach. Only point I would change is needing to strip the bed halfway through our 10 day stay. I think the hotel staff should have done this for us rather than dropping the linen at the door. We were upgraded to a one bedroom apartment located a block away as they were full due to a huge storm that prevented other travellers from leaving. Although the weather was horrendous and we couldn't go out, the apartment was lovely so we didn't mind staying in. It was beautifully furnished with fully equipped kitchen, luxury linens etc. We are regular visitors to Byron and usually stay at the Belongil end. We thought we've give Julian's a try and were happy with the location - close enough to walk to the pass and lighthouse but also to town. The room was nice but our main gripe was the noise: the walls are really thin and we could hear everything in the room next door, which meant 6am wake-ups every day. Don't think we'd stay again. 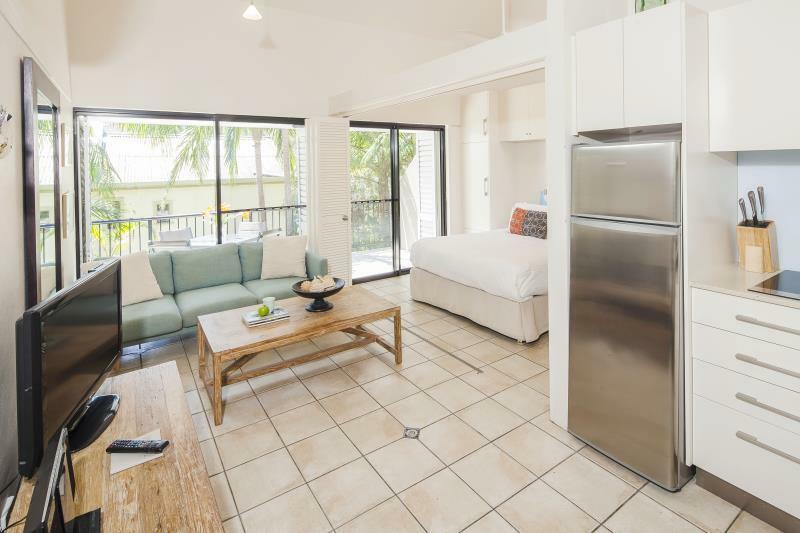 So not the greatest spot for a relaxing secluded getaway, but a good enough base for an active getaway in Byron. We had a great time at Julians apartments but our room was too small for our length of stay which was a week. The bed was a little hard for my liking and the pillows needed to be replaced. Also missing was an extraction fan above the stove...is that legal? Overall I would recommend the apartments as they were good value for what we paid...but book in advance to get a good price. well what a place close to the beach not that far from city centre , rooms were sensational no cost spared , not to mention my girl friend started here contraction at st julian's apartment now we have a healthy baby boy named byron .top place and spot , very quite indeed thanx guy s .